Custom-made solution - WHS-Handling spol. s r.o. Automation of manufacturing processes in plastic industry forms a significant part of our supplies. 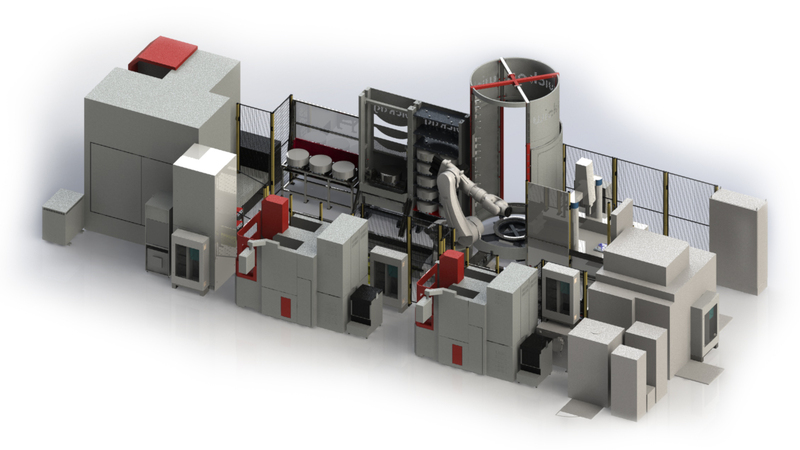 Those are usually robotized workplaces supplementing injection moulding machines designed to prepare and feed inserts or to remove finished parts. Then they can be tested, assembled, labelled and packaged. From simple assembly preparations, testing stations and single-purpose machines to complex production lines and extensive automations of manufacturing processes. We have successfully engaged in realizations of complex solutions in the area of unit production in mechanical engineering, mostly in tool works, for many years. Our lines can connect to and automatically operate for instance sinker EDM machines, CNC centres for electrodes manufacturing and parts machining, 3D measurement, stations for parts cleaning, containers for electrodes and pallets with machined parts, systems for labelling etc. The CMS Cell Management System to control the line is then added. CMS facilitates easy management of programmes, creation and editing of individual manufacturing requests by an operator, interconnection of internal ERP systems and a number of other features. Your machines and equipment can work independently and manufacture even at nights, weekends or holidays.